Media Workers: It Could Be Worse. It Could Be 1977. On a sojourn upstate, my wife and I stumbled on a little antique market and, there, a 1977 issue of New York magazine. In this particular issue: Seattle Slew’s chances in the Triple Crown (good), the opening of Studio 54 (bananas), and a review of Annie Hall, which is printed below in its historically embarrassing entirety. 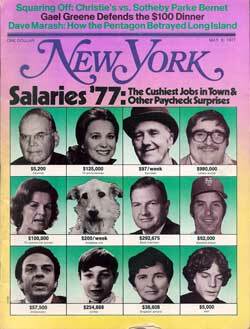 That princely sum was the 1977 annual salary of Eileen Shields, Time‘s New York reporter. On the plus side, it was a 10% jump over her $21,000 1975 salary. In 2010, twenty-one grand is below the Federal poverty level for a family of four. The list is amazing – so many names you recognize in jobs that you didn’t know they held. (David Dinkins was City Clerk! John Marr was the city’s Chief Epidemiologist!) Here is the list, in full. I’ll leave you with one last ego boost. Robert Moses, the architect of much of modern New York City transportation, earned $35,000 in 1977. In 2005, New York‘s survey discovered that Anna Wintour‘s assistant made $40,000. I think we can all agree that when assistants at magazines earn more than public servants, it’s a sign that the universe is shifting into proper alignment. Just don’t adjust for 2005 dollars. * Unless, of course, you do. In which case… man. I mean… man.